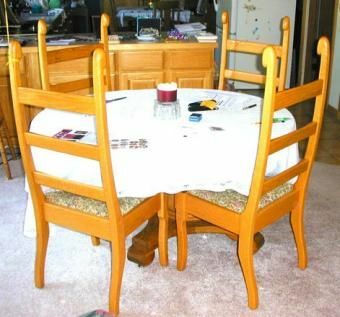 Constructed in 1984 from solid red oak, this set of six (6) ladder back dining chairs have been in service for over 28 years, and they look as good as when they were new! The only change to the chairs has been that the material covering the chairs needed to be replaced. Constructed entirely using mortise & tenon joinery, this set of dining chairs has proven their longevity & stamina. 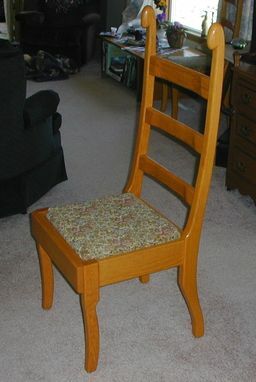 The chairs were finished with several coats of hand-rubbed oil/polyurethane mix. The owners have waxed & buffed them many times to maintain their luster.